Rotary Margaret River were asked to help in remodelling a garden at a house in town where three disabled people live with their carers. Club members organised a working party to move a fence, enlarge an enclosed garden area and relocate two garden beds. After 5 months the garden is now fully established and looking great. The latest palning meeting attracted 31 attendees and there are now 18 new names on the register following this second meeting. 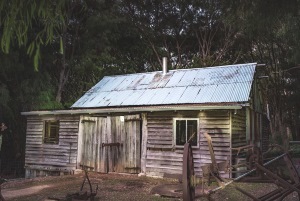 Membership fees have been set at $30 until the shed opens with 28 signed up. Currently estimating 18 months until the Shed opening. Rotary Margaret River were 'hands on' as the Rotary Club of Pinjarra organised a working weekend to support farmers in the area affected by the recent fires. 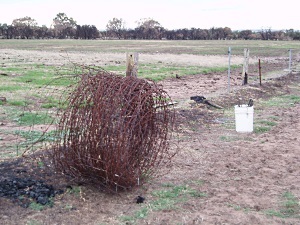 Working on a 340 acre property where nearly every piece of fencing was destroyed beyond repair a group of 9 volunteers cleared over 5km of damaged fences stacking wire for removal and leaving the fence lines cleared ready for replacement work to begin. 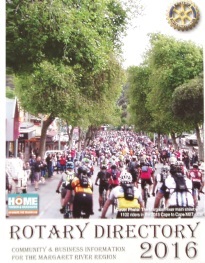 The Rotary Directory for 2016 has just been published. 9,000 copies will be distributed to homes across the region. The directory is for local residents and visitors to easily access local business service providers in the Margaret River region. Following a three week construction period the redeveloped South Bank dual purpose trail is now open. 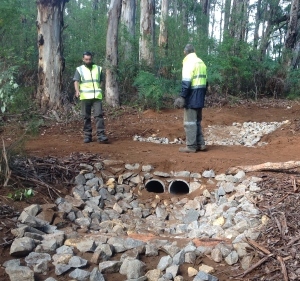 The new drainage for the trail has now been completed. Running along side the Margaret River from the Old Settlement to Barrett Street Weir the new trail will provide walkers and cyclists with an interesting and scenic circular walk along the banks of the river. Local School representatives were presented with their microscopes as part of the Microscope for Schools Project. A total of 240 microscopes have been distributed to our local schools. All schools were thrilled to receive these and conveyed thanks to Margaret River Rotary for providing this equipment, which they were sure the students would gain much use from in their learning programmes, including the MR Rotary largely funded Cape to Cape Catchment programmes. 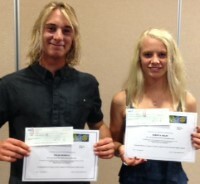 Gracetown Surfing Scholarships have been awarded to Jamaica Selby and Jolan Bonelli. Club members joined the parents of the awardees and the Club Youth Committee in congratulating both Jolan and Jamaica in receiving the awards. Both were presented with a cheque for $500. Awards and certificates were presented by Rod Pether on behalf of Rotary Margaret River. Huge thanks to all the volunteers who assisted with the Fun Run on the weekend. 378 people registered for the Run/Walk/Trail, with around 325 showing up on the day. Shame about the wet ending, but everyone who came through the finish line appreciated the welcome, the water bottles and the assistance of the volunteers. It was good to see so many Rotary vests out and about. We are delighted to welcome two Margaret River residents as new members of the club. President Terry led the induction of Brian and Lyn Warren into the club at the meeting on Monday night. We hope that they will both enjoy many years of fun and fellowship as club members. with the 2015 edition being distributed this week. 8000 copies will be distributed free throughout the Shire of Augusta Margaret River. Watch out for delivery of a new edition to your letterbox or local post office. Margaret River Rotary Club have been very much at the centre of the local news since the New Year. To enable local residents to see more about all the projects that the club runs we have our promotional trailer out and about around town. If you see the trailer please stop by and say hello. 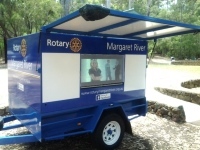 The trailer will be at Rotary Park tomorrow (Tuesday 13/01/15) from 11.30am until 14.30 so come and take a look. Or Wednesday (14/01/15) the trailer will be at the White Elephant - Gnarabup from midday until 15.00. The club are pleased to donate $10,000 to the Cape to Cape Catchments Group to further extend the Our Patch program. 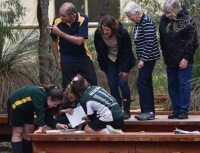 The funding supports educational visits by classes from local primary schools to local waterways/wetlands in the region. Cape to Cape Catchments Group education officer Tracey Muir said Rotary had been one of the strongest supporters of Our Patch since its inception, the program now reaching 500 students from Cowaramup to Augusta. Margaret River librarian Rachael Drummond has been selected to participate in a Rotary Vocational Exchange to Turkey in 2015. Rachael was one of 4 selected out of a field of 8. Rachael reported to the Club on her progress learning the Turkish language and the excitement of team meetings. The team leaves in April and their trip will coincide with the Centenary Anzac commemorations. The Harvey Bike Riders arrived in town on Friday as part of their fund raising project for the Childrens Cancer & Leukaemia Foundation –this is their tenth year and, if they met their target of $60,000 from this year's ride, they will have raised $600,000 in total. The Margaret River Rotary Fun Run had been confirmed for this year. Set for Sunday 30 November 2014, the event has been moved back a month from its previously slated date to move it away from conflicting events in a busy shoulder season calendar. Dave Macauley talked us through his professional surfing career, from catching the wake of ski boats in the Collie River as a young kid through to his days finishing as high as 3rd in the world rankings, his surfing travels and the creation of a family…who are now competitive surfers in their own rights. This was one of the best presentations we have had this year. Many thanks to Dave. A new inflatable water trampoline has been purchased by the club as the existing "Rotary Floatery" is sadly getting old and worn out. Watch out for the 'new' trampoline at Gnarabup when it is launched in December. Margaret River Rotary Club's 'Friends of Rotary' Scheme is designed to provide an opportunity to people who cannot, or may not wish to, join the Club as a Rotarian at the present time (eg due to time and travel constraints ) but who nevertheless would like to assist the local Community by getting involved in the Club's Projects and activities. To find out more click here. STOP PRESS!! Thanks to all who have volunteered already and to the two new volunteers today Myriam and Jeff. Why not you? Guest Speaker Brett Pollock, Treasurer of WA Men’s Shed Association gave a very motivating and inspirational talk on the community benefits of having a men's shed and how they operated. We are delighted to welcome two Margaret residents as new members of the club. Sally Hayes led the induction of Gary and Michelle Miller into the club at the meeting on Monday night. We hope that they will both enjoy many years of fun and fellowship as club members. Club Member Smiler Gale has been presented him with a second Sapphire Pin to add to his Paul Harris award in recognition of almost 54 years of service to Rotary. We welcome Karen Tearney into the club. Karen has been associated with the club for several months through a contract she has for public relations and media. We welcomed Karen and the club is fortunate to attract such a high calibre member. Arts Margaret River Readers and Writers Festival was a great success this past weekend. Over 1000 children enjoyed visits from an author and an illustrator; the sessions were held in the schools and very positive feedback received from parents whose kids attended. Reading Rabbits continues to grow and flourish with the year 1 young readers in our primary schools. Bowelscan is happening at the Margaret River pharmacies this month and kits are now available. Bowel cancer results in over 4000 deaths per anum in Australia with a strong impact on those over 40. The members of the club are holding an information evening at Adinfern Winery on Tuesday March 25th. If you would like to attend to find out more about Rotary Margaret River and the work of Rotary worldwide please email mhopkins@iinet.net.au. With the help of Tom Ralph and friends the Rotary Floatry is back in the water for a another season at Gnarabup. There are 3 new moorings anchoring the raft which will no doubt be as well used by the community as it is every year. The club is sad at the departure of member Paul Daly (Bear) whose career is taking him to Perth. An eventful week for Margaret River. Saturday 9.40pm the town was rocked by an earthquake and then Sunday night into Monday morning a cold front brought winds that uprooted trees throughout the area. 9th September - Busy meeting for the club. 2 visitors from the UK and 6 local guests. $200 collected from the Wishing Well. New Rotary Flotary for the coming summer. The opening days of spring and bright sunshine was on hand to welcome the members of Margaret River Rotary Club who tackled an over grown garden in the south of the town. Each year Margaret River Rotarians and other community volunteers conduct a job interview exercise with year 12 students from the school’s vocational studies program. The 2013 interviews were held from the 27th to 29th August. With 34 interviewers on 12 panels based at various locations around the town a total of 41 students were interviewed on a range of careers including construction, media and print, sports, and clerical. An array of guests, a fine meal, great conversation and a knockout presentation from Catherine Marriot. August 26th: Catherine gave a powerful presentation to the evening meeting on the importance of effective communication. She spoke of the need to be on the front foot, empathetic with your listener and rock solid in your own position. The latest in bound Youth Exchange Student Chris from Germany arrived in Margaret River after two long flights via Dubai. Chris will be settling in over the next few days. Speakers at this weeks Rotary meeting were Jacqui Biddulph and husband Bob - local dairy farmers. They gave the meeting an interesting talk with a perspective on the WA dairy industry. Next Rotary Youth Exchange student chosen. Kaitlyn O'Connor has been selected as next year's Rotary Club of Margaret River Outbound Youth Exchange Student but as yet does not know which country she will be traveling to. - On Saturday 3rd August Kaitlyn is having a cake stall in front of IGA to help fund raise for her trip Latest news the cake stall raised $1300. The change over meeting on Saturday 13th July featured good company, good food and a nice review of the year from outgoing president Richard Vos who hands the presidency to Fran Temby for the next Rotary year. 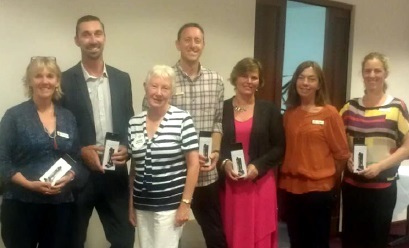 The Rotary club of Margaret River awards Paul Harris Fellowships to Rotarians or members of the community who have shown tangible and significant assistance for the furtherance of better understanding and friendly relations among people of the world. This year (2013) the club has chosen to award three Paul Harris Fellowships to club members Sally Hayes, Julien Sanderson, and Doug McKennay. The Shire of Augusta Margaret River have added a footpath through Rotary Park. The footpath leads from the entrance, down past the playground area to the new barbecues. If you're in Margaret River drop in and see the excellent addition to the Park. Guest Speaker. Paul Daly on the recent Police GSE to the USA. Paul was Team leader on a recent Rotary Group Study Exchange to the North East of the USA. They were away for 36 days, spending 24 hours flight time getting there. They did 15 presentations, attended a District Conference, attended countless Rotary family social functions and had a great time. Paul noted that the pace of the trip was gruelling at times and not a ‘trivial’ exercise. This weeks guest speaker was Tracey Muir speaking about Cape to Cape Catchment Group. Environmental Programs for local schools. Tracey described her program, which features environmental education IN the environment. An interactive classroom and excursion based program that has expanded to all the local primary schools Year 3 and Year 6. 8 students are definite starters for the December 2013 Alternative Leavers week. 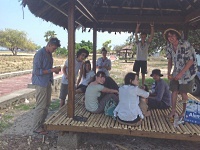 Alternative Leavers Week is a project in partnership with villages in Timor Leste; a team of school leavers from Margaret River visits East Timor to meet the people, learn about life and work on community development activities. This project aims to provide support for the Timorese people and an understanding of life in a neighbouring country like Timor. If you are or you know students who would like to participate please contact the club. Youth Exchange Student Ingrid sent a great report back from Thailand where she is currently enjoying her role as a Youth Exchange Student. The Youth committee has donated $2000 to the MR Primary School to run their 'Seasons of Growth' program. An interesting presentation from Adrian Prendergast with his and wife Claire's plan for Wharncliffe Mill. Visiting Rotarian Geoff Wyatt from Rossmoyne Club won the jackpot raffle on Monday but gave the prize money back to President Richard to go to a club project. We, of course, chose End Polio Now. We were down to the last chip so it would have been approx $170 added to the coffers. Club members Lloyd and Rod P visited Punmu recently to talk about a proposal for a water slide as a health initiative believed to be equally effective as a swimming pool but more cost efficient to both build and operate. After 25 years of hard work, Rotary and its partners are on the brink of eradicating this tenacious disease, but a strong push is needed now to root it out once and for all. It is a window of opportunity of historic proportions. Read more and watch the video. A huge success for this year’s Margaret River Readers and Writers Festival – Words Uncorked and particularly the Behind the Label sessions sponsored by the club. Club community service project for May. is Bowelscan WA, a district coordinated bowel cancer awareness program – 'Catch Cancer before it Catches You'. 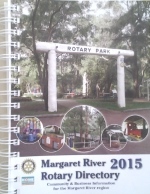 Rotary Margaret River works in partnership with local pharmacies that stock and sell the kits. Rotarians collect kits returned from participants and deliver to a local pathology laboratory for testing. News this week from Atauro High School, East Timor. The Arts Margaret River Readers & Writers Festival takes place 15-17 May. Margaret River Rotary Club sponsors the amazing ‘Behind the Label’ program. This week the club met at the Margaret River Volunteer Fire & Rescue Station. It was a joint meeting between Rotarians and members of the local Lions club. The main event of the evening was the presentation of the Thermal Imaging Camera (TIC) which was funded jointly between Margaret River Rotary Club and the Lions Club. Our most recent guest speakers have all been sponsored by Rotary Margaret River to participate in youth leadership and science experiences in the past few months. They came to the most recent club meeting and spoke about their experiences. Five new members for the club this year. What's stopping YOU! Maybe you've seen a need in our community and wondered how you could help. Maybe you want to use your professional skills to help others — or even learn new skills. Maybe you're seeking connections with other service-minded professionals in our community or abroad. Whatever your reason, joining Rotary can help you achieve these goals, and so much more. See why these men and women are members of their local Rotary club. Watch this short video and learn more. aybe you’ve seen a need in your own community and wondered how you could help. Maybe you want to use your professional skills to help others — or even learn new skills. Maybe you’re seeking connections with other service-minded professionals in your community or abroad. Thanks to all who supported the Sausage Sizzle at Home Hardware on Saturday March 30th. The Rotary Youth Exchange Program was highlighted last month with a reception at Parliment House in Perth on February 22nd hosted by the Rotary Club of Matilda Bay and Barry House, president of the Legislative Council. Barry House, US Consul Aleishia Woodward, with Margaret River Rotarians President Richard Vos, Sgt Paul Daly, and the Margaret River Rotary Clubs current in bound student, Joe Richardson. The Rotary Club of Margaret River has donated $2,500 to Rotary Overseas Medical Aid for Children (ROMAC). Now in its 20th year of operations ROMAC’s mission is to provide medical treatment for children up to 15 years from developing countries in the form of life saving and/or dignity restoring surgery not accessible to them in their home country. Quality Inn Margaret River Donate $126. Inbound: Rotary District 7610 West Virginia, USA. Team Leader Rotarian Bill Croxton with team members, Jordan Clough, Megan Leigh Kuhn, Dwayne Petersen, Diana Truong. Rotary Australia World Community Service (RAWCS) recently received $2500 from the Rotary Club of Margaret River. This money will go to help the Prosthesis Foundation at Chiang Mai Thailand; they create artificial limbs for children injured by land mines. What a great achievement from joining RC Manjimup at 26 and the suggestion of his bank manager (not to be denied) to the big move to Margaret River 11 years ago in 2002. PHF Doug has been very much involved with all roles in Rotary including President of Manjimup 1975-76 and assistant governor 1976-77. 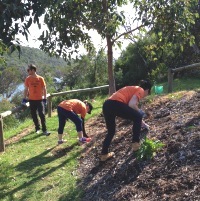 At Margaret River has been active with vocational visits and activities. Doug is active with the Fun Run and has been a safari leader for youth exchange travels around the north-west. Rotarian Rod Pether began one of the most important train of events in our club history by confronting our members with a question about our apparent lack of effort to address disadvantage in Aboriginal communities in Australia. Encouraged by the response of the Club to his challenge, Rod found a candidate community in Punmu in the East Pilbara region. Remote and acutely disadvantaged, the community were keen to seek assistance to bring a dream to reality in the cause of better school attendance, healthy lifestyles and community engagement. Their chosen 'vehicle' was a covered multi-purpose sports court. During his visit to the club this week he enthralled us and made us laugh with his pictures and stories of North West Safari. He described the experience of sailing on a catamaran out of Coral Bay, staying at New Norcia, bushwalking in Karajini and Kalbarri and dolphins in Shark Bay. Our club has used community projects in Timor Leste to engage Year 12 Margaret River school leavers in community service. 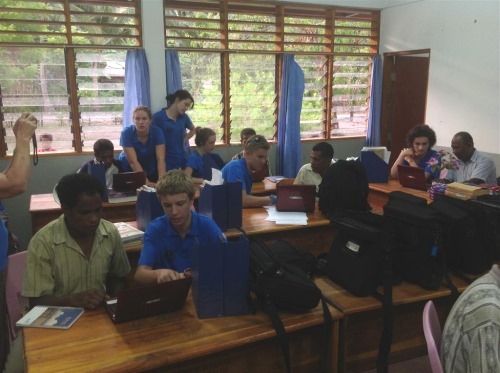 This year the Margaret River kids each carried a laptop computer loaded with some context appropriate educational software (GCompris) on their trip to Timor Leste. The laptops will assist our partner schools to bring digital learning into the classroom. The intention is to hurry slowly. We hope to make education a centre-piece of our engagement with engagement with Timor Leste for many years to come.